When playing poker, one of the key strategies is to appear confident. One of the ways to do that is to learn poker chip tricks. These tricks require good hand coordination, practise, and concentration to be effective. They can help convey confidence when you want to bluff a bad hand or intimidate other players with your casual yet talented handwork as you play a game of Texas Hold'em Poker, but they can also be used for fun to show off to your friends and family members. 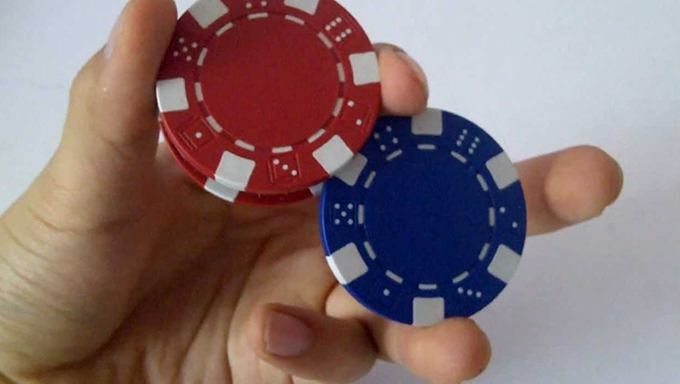 Here are a few examples of poker chip tricks to get you started. The knuckle roll trick is one of the more well-known poker chip tricks, as it seems to be the go-to in movies for characters to show how adept they are at poker. While it may seem complicated to pull off, it's actually surprisingly simple. All you need to do is take a poker chip and roll it across your fingers. To start, pinch the chip between your thumb and forefinger, then roll it over your forefinger, pinch it with the next finger, and keep it going. It's much easier than it looks. Practise until you get good enough that it feels like second nature. You might find the chip twirl a little easier, since you have more control over your chips, although practise is still important. Unlike the knuckle roll, this chip twirl uses three chips instead of just one (more if you're feeling bold). When practising, you don't have to worry about the poker chips falling out of your hands, so you can focus on mastering the mechanics and learning how to do them faster. The faster you go, though, the more at risk you are of dropping your chips. This is a nice trick to do absently, making the rotation of the chip look like it's something you learned casually. Of all the tricks shown, the thumb flip is probably the most rewarding to practise. It's not much easier than the chip twirl, but it has the advantage of being simple to learn while also being simple to master. Like the chip twirl, it takes multiple chips (usually three or four). Once you learn how to get the fine movements down, which shouldn't take long, increasing your speed is easily accomplished through practise. Once you get your speed up, you'll really impress others who don't know how to do these deceptively easy poker chip tricks. While the thumb flip is probably the easiest trick to master quickly, the shuffle is the easiest to learn. The steps are fairly simple, and, unlike the knuckle roll, this trick lacks the risk of chips falling, since they're stacked on the table instead of placed on your hand. This chip trick works best with more chips, and it requires an even number of chips in order for the two stacks to fold together perfectly. You may have to practise this a few times to get it down pat, but the mechanics are simple enough that you shouldn't have much of a struggle, and people around you who don't know the trick will have no idea how easy it is. When you're ready to take a break from practising your poker chip tricks, try out Casino Hold'em, a poker variation similar to Texas Hold'em, at HippoZino Casino. You may not be able to show off your poker chip tricks, but you can still practise while you play online.